This simple standalone home alarm project is a good project for those who are eager to know the concept of home security system. 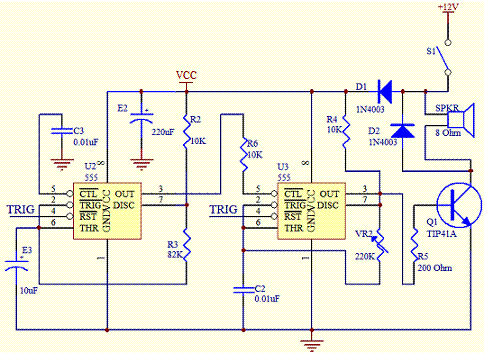 This circuit which consists of three 555 timers gets the input from a contact that could be connected to a motion detector or any momentary contact that monitors a certain process. Once the contact is momentarily closed, the first timer which is configured as a monostable output will output a high pulse with a duration up to a maximum of 220 seconds. 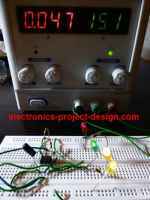 This output is fed into the second timer which is configured as an astable 1Hz square wave generator. 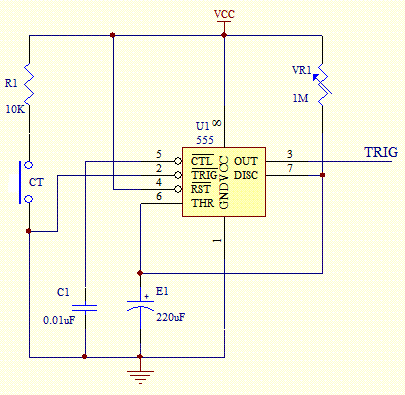 The output of this second timer is then fed into the third timer to control its frequency modulation. This frequency modulation will then power a speaker and generate a siren tone similar to the police siren. The schematic of the project is as shown below. The first timer U1 is configured as a monostable timer with a variable timing of up to a maximum of 220 seconds. The timing can be changed by adjusting the VR1 1M ohm potentiometer. If you need to further increase the timing, the electrolytic capacitor E1 can be changed to a larger value. Once the contact CT is momentarily closed, a pulse will be generated at the output pin 3 of U1. U1 is then feed into pin 4 RESET of both U2 and U3 timers causing both timers to start their astable mode operations. U2 is configured as a square wave close to 1 Hz astable oscillator by fixing the values of E3, R2 and R3. The output of U2 timer is used to feed the control voltage of the U3 timer through resistor R6 where it is subjected to frequency modulation. This frequency modulation will generate a tone similar to the police siren. The frequency of this tone generator can be varied by changing the value of potentiometer VR2. When set to its maximum value of 220k ohm, it will have a tone frequency of approximately 320 Hz. The output of U2 is used to drive a power transistor which in turn drive an 8 ohm speaker. Diode D2 is used to prevent the damage of transistor Q1 due to the back emf generated by the speaker during the ON/OFF driving of the speaker.